Scelbi stands for: scientific, electronic, and biological applications. The project was developed by Nat Wadsworth, that after an 8008 presentation decided to develop a computer on byself. During the project he had two heart attack, the manual was completed from the hospital bed. 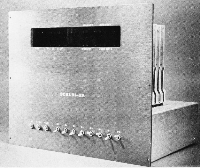 After the model B (B for Business), Scelbi left the hardware market and go into developing software.